Regardless of the rest of plants existing on the planet and especially in El Salvador, orchids deserve a special mention. Most of their genders come from Greece, as well as the word Orchid where "Orchis" in greek means testicle, since its bulbs look like dog testicles. Orchidiologists around the world have studied orchids in much bigger countries in America and have obviously found much more species than in El Salvador; but regardless of our small territorial extension (little more than 20,000 kms) our orchid inventory totals 362 species, classified into 93 genders, 11 of those being completely new to the science. Paul C. Stanley (1921) was one of the first orchidiologists to study these flowers in the country, together with Salvador Calderón (Salvadorian). 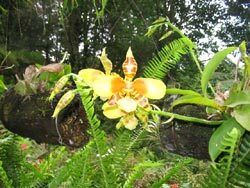 Most of the orchids in El Salvador grow at the National Park of Montecristo, where more than 75 species can be found, including Ponera pellita, found by Fritz Hamer, one century after first being discovered in Germany; which caused the garden area to be named "Century Garden". Other places were orchids are found rise above the 1000 meters above sea level, among those: Cerro Verde where six new species have been found; El Pital in the northern part of Chalatenango (Highest point in El Salvador) at 2730 meters above sea level (here two more new species have been found: Isochilus pitalensis & Isochilus aurantiacus); El Imposible National Park ( 2 more new species); in San Francisco Menendez (region of Ahuachapán); at one of the nearest places to San Salvador : The San Salvador Volcano or "El Boquerón" and the Botanical Garden "La Laguna". The broadest gender of Orchids in the country is the Epidendrum with only 59 species of approximately 1000 known and distributed from North Carolina to Argentina. Its name was given by Carl von Linné in 1753 and came from two greek words: epi = on top and dendrum = tree. Most of the Salvadorian species of orchids are found in the Oakes Herbarium Ames, Botanical Museum at Harvard University, in Massachusetts, U.S.A.
Leslie A. Garay (AMES at Harvard University) who did a great job in identifying orchids together with Fritz Hamer, and led to the creation of the century garden in Montecristo Park. Some others who have followed their steps: Dr. Francisco Serrano former Director of national parks at the time Hamer held his research, Mario Levy, Van Severen and Victor Helleybuck ( who has also written books about the Salvadorian flora). To the memory of Fritz Hamer, author of "Orchids of El Salvador" written in Spanish, English and German (German citizen, Salvadorian resident).